A happy accident sent a copy of the final book in the Bland Sisters trilogy to my desk this month. And what a delight! Written by Kara LaReau and abundantly illustrated by Jen Hill, the series is probably meant for 8-year-olds, plus or minus a year ... but it's a dandy entertainment for willing adults. Jaundice and Kale Bland are twin sisters -- at least, they think they share a birthday -- who like everything flavorless, colorless, and boring. Thus, their explosive exit from Dullsville to wild and risky living is absolutely NOT what they wanted. 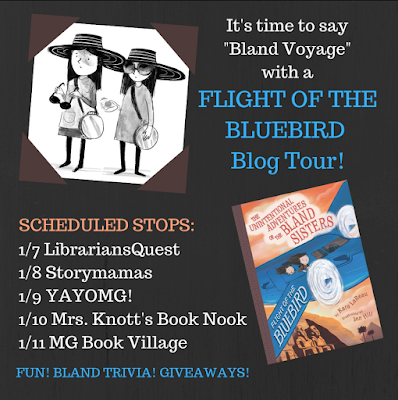 Hence the supertitle of the trilogy: "The Unintentional Adventures of the Bland Sisters." Book 1, The Jolly Regina, sees the sisters kidnapped by a team of "lady pirates." Swashbuckling and sea chanties, and of course the risk of seasickness and falling overboard, follow. Test-drive this notion with the kids in your circle: "Raise your hand if you'd like to be snatched onto a ship by pirates who are happy and laughing and have an important mission!" Book 2, The Uncanny Express, follows the lead of Agatha Christie by stranding Jaundice and Kale with "ten strangers on a train" (including a magician). And the girls are somehow expected to rescue the situation -- what? Really? Cool. 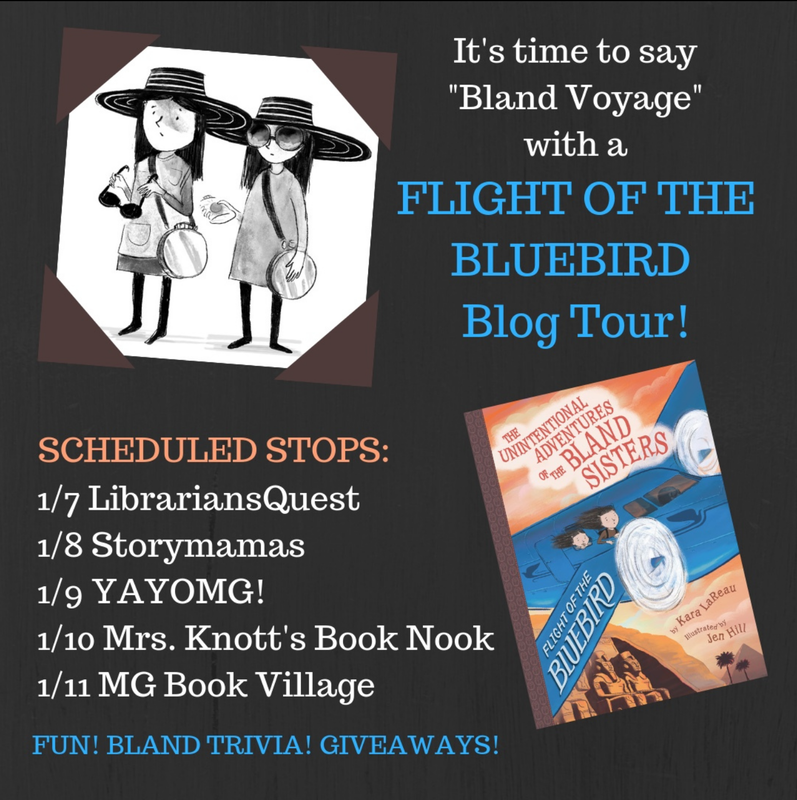 Book 3 is Flight of the Bluebird and opens on a small airplane, being aptly piloted by the dashing Beatrix Airedale. (This is only the first of many intricate half-puns, some of which require a grown-up's literary experience or time spent watching old movies ... like when a feisty restaurant owner chases her staff member with the threat, "Don't play it again, Sam!") Says Beatrix to the girls, "You two should be glad you have parents who encourage you to explore the world. Mine stopped talking to me when I took up flying." "They don't talk to you, at all?" Kale asked. At least the Bland Sisters' parents sent them letters, and talked to them in their dreams. Aside from the radical airship ride itself, Kale and Jaundice have a mission to find (and save!) their long-lost parents. If they succeed (canny adult readers will be aware), the point of the adventure series -- yes, parentless children who have to solve strange situations on their own -- may vanish. But there are magical scarabs, symbol-strewn dreamscapes, and villains in pyramids ahead. How can the girls resist? Even better, author Kara LaReau on her website explains the other books she has in the works already, and I'm convinced that there will be more reading adventures ideal for that youngster -- of course, I will need to purchase them and sit down to read them right away myself (just so I know what I'm sending to him, right? ).